A LANDSCAPE OBSERVATION WITH HISTORY AND CURRENTLY A TRADITION. Anyway, as a memorable fact of history, I want to highlight the first distant picture preserved wich dates from the year 1898. It was get from Marseille by Oscar Gross. I think that this picture may be is the oldest photograph of an extremely distant silhouette, and therefore, the author a pioneer in this field, a historical reference not only for France but for the whole world. Subsequently many observations returned to forget until at the end of the 20th century they were remade. A photo was made in 1970 by Arlette Bergés and then from 1998 began a real massive passion for it!. 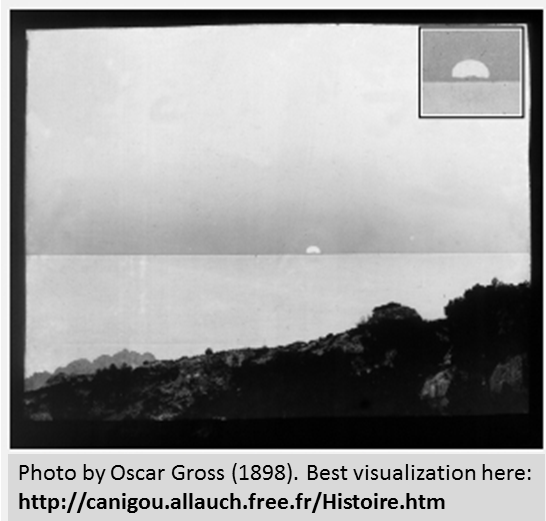 Names like Françoise Passelaigue, Marie-Aude Pradal, Henry Pes, Françoise Coulier, and especial Michel and Martine Aperio are already part of the history of the astrolandscape photographic devotion by the Canigó, in some ocassion even with a green flash. 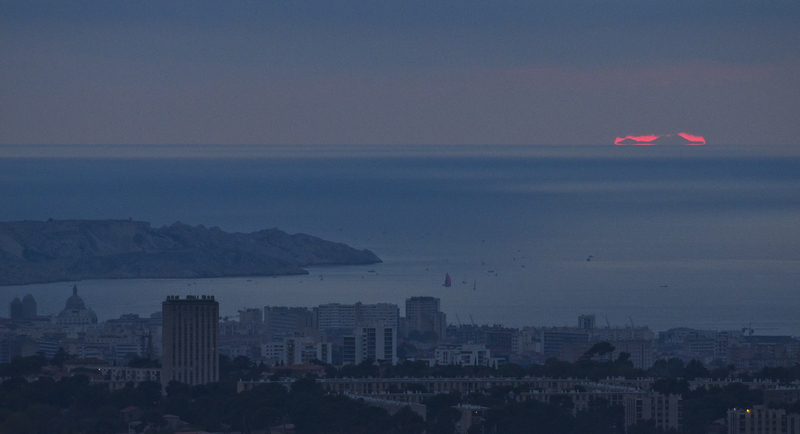 At present there are even more photographers who often observe and portray this silhouette from Marseille. The modern “Canigó fever”, born in 1998 (just a one hundred years after the picture of Oscar Gross) is maintained strongly with a lot of pictures highly detailed and well-explained observations. About it we can see this website of Canigou with detailed pictures and explains; also the Astrosurf pages with interessant informations also, or -of course-, also the website that we already mentioned before of Alain Origné, who moreover of excel.lent pictures, he also gives lectures and promotes events to portray him. 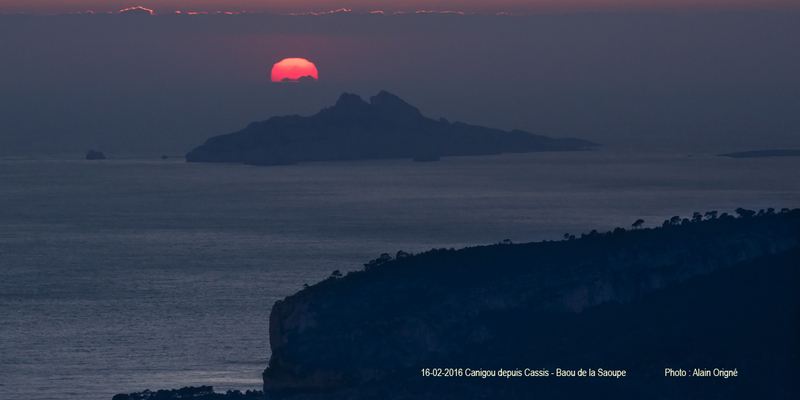 On the other hand, from other different places of the Provence region, there are other super photographer very specialist, Bruno Carrias, from Aix en Provence, who portrays the Canigó throughout the year, making it perfectly aligned with the Sun in a lot of days of different sites. His photographic work is meticulous and enormous and other day I think to write a report of someones of his photos and about his analisies. To conclude our report we want to show another beautiful image of Alain Origné, in this case from the cliff at Cassis -also near of Marseille- taken in february. On the second plane, a real island: Riou, with a similar aspect of Canigou! but only distant of about 12 km. A very interesting perspective of Alain Origné also taken by Michel Aperio in this sequence. < Previous Mt. Argentario – Mt. Rotondo | 170 km. Next > Geigelstein – Hintertux Olperer | 89 km.